An Exotic day spa garden of all kind offers absolute relaxation therapy, located in on south east of the holiday island. 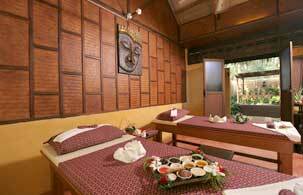 Panwa Garden & Spa treats you with completed packages away from stresses and strains of outside world. With stunning and particular casual herbal garden atmosphere, this is the perfect place to recharge your batteries. Stepping back to nature and experience real tropical retreat with indoor and outdoor spa facilities designed in Bali style and nice blend to contemporary Thai tradition way. Panwa Garden & Spa treatment line mainly using only fresh herbs for beneficial in healing, astringent and rejuvenation of skin and health... Secret of Thai beauty and healthy. Not only spa service we also represent as a spa consultancy too. For more in formation please feel free to contact us.